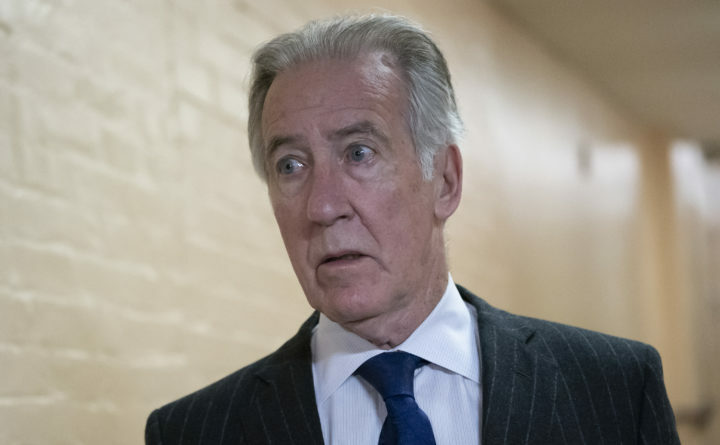 House Ways and Means Committee Chairman Richard Neal, D-Massachusetts, arrives for a Democratic Caucus meeting at the Capitol in Washington, April 2, 2019. Neal, whose committee has jurisdiction over all tax issues, has formally requested President Donald Trump's tax returns from the Internal Revenue Service. WASHINGTON — House Democrats are giving the Trump administration a hard deadline of April 23 to turn over President Donald Trump’s tax returns, pushing back against Treasury Secretary Steven Mnuchin’s skepticism over their request for the private records. Rep. Richard Neal, D-Massachusetts, chairman of the House Ways and Means Committee, on Saturday sent a two-page letter to IRS Commissioner Charles Rettig rebuffing Mnuchin’s recent statement that Treasury would miss House Democrats’ initial April 10 deadline for the returns. Mnuchin told reporters Saturday that he was trying to move carefully in overseeing a request that raises “very, very complicated” legal questions, emphasizing that his decision could have long-lasting repercussions for future requests by Congress to the IRS. He said that Treasury’s legal office has begun meeting with lawyers in the Department of Justice but that he has not personally spoken with the attorney general about Trump’s taxes. Earlier this month, Neal wrote to the IRS, asking for six years of the president’s personal and business tax returns. Trump refused to release his tax returns during the presidential campaign, breaking decades of precedent where candidates for the White House voluntarily released their tax returns. Trump claimed it wouldn’t make sense to release his tax returns while, he said, they are under audit. In his letter, Neal argues that the IRS has an “unambiguous legal obligation” to turn over the returns under section 6103 of the tax code, which states that the treasury secretary “shall furnish” a request from the congressional committees with tax oversight.